BEIRUT, Nov 21 2014 (IPS) - Staring at the floor, Hassan, a 21-year-old Syrian refugee from Idlib in northwestern Syria, holds a set of identification papers in his hands. He picks out a small pink piece of paper with a few words on it stating that he must obtain a work contract, otherwise his residency visa will not be renewed. Hassan (not his real name) has been given two months to find an employer willing to cough up for a work permit, something extremely unlikely to happen. After that, his presence in Lebanon will be deemed illegal. Hassan, who fled Syria almost three years ago to avoid military service, tells IPS that all that awaits him if he returns are jail, the army or death, so he has decided that living in Lebanon illegally after his visa expires is his best bet. Hassan, who fled Syria almost three years ago to avoid military service … [says that] all that awaits him if he returns are jail, the army or death, so he has decided that living in Lebanon illegally after his visa expires is his best bet. Sitting next to Hassan is 24-year-old Ahmed (not his real name) from Deir Ezzor in eastern Syria, who lost his residency one month ago. Since then he has been forced to watch his movements. “I live with permanent fear of being caught by the police and deported,” he says. Since the start of Syria’s civil war in March 2011, over 1.2 million Syrians have sought refuge in Lebanon, where they now account for almost one-third of the Lebanese population. Current legal restrictions affect the admission of newcomers, renewal of residency visas and the regularisation of visa applications for those who have entered the country through unofficial border crossings. One aid worker who is providing assistance to Syrian refugees in Mount Lebanon told IPS that the majority of the Syrian beneficiaries they are working with no longer have a legal residency visa. Aranki notes that fear of being arrested often forces those without legal residency papers to limit their movements and also their ability to access various services, to obtain a lease contract or find employment is severely limited. It could also impede birth registration for refugees -with the consequent risk of statelessness, or force family separations on the border. Before May this year, Syrians could usually enter Lebanon as “tourists” and obtain a residency visa for six months (renewable every six months for up to three years), although this process cost 200 dollars a year, which already was financially prohibitive for many refugee families. However, NRC has noted that under new regulations Syrians are only permitted to enter Lebanon in exceptional or humanitarian cases such as for medical reasons, or if the applicant has an onward flight booked out of the country, an appointment at an embassy, a valid work permit, or is deemed a “wealthy” tourist. Since summer 2013, restrictions for Palestinian refugees from Syria have become even more severe. Under its new policy, the Lebanese government also intends to participate in the registration of new refugees together with the UNHCR. Khalil Gebara, an advisor to Minister of Interior Nohad Machnouk, says that the government has taken these measures for two reasons. Secondly “because government believes that there are a lot of Syrians registered who are abusing the system. A lot of them are economic migrants living in Lebanon and they are registered with the United Nations. The government wants to specify who really deserves to be a refugee and who does not”. Ron Redmond, a UNHCR spokesperson, said that the U.N. agency has “for a long time” encouraged the Lebanese government to assume a role in the registration of new refugees and affirms that registration is going on. 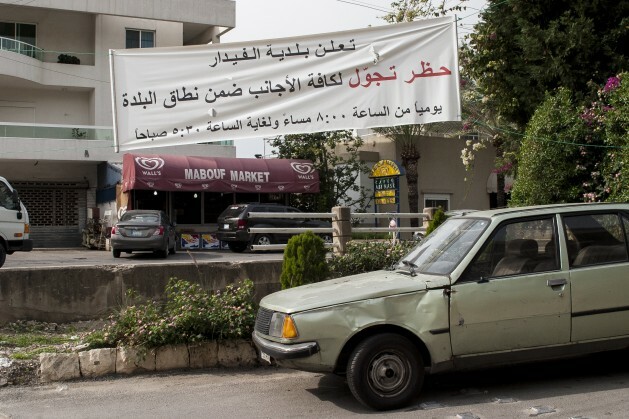 Meanwhile, accompanying the increasing fear of deportation from Lebanon, Syrian refugees have also been forced to deal with routine forms of discrimination. Attacks targeting unarmed Syrians – particularly since clashes between the Lebanese army and gunmen affiliated with Jabhat al-Nusra and the Islamic State in Arsal in August – have also occurred. Given such realities, life in Lebanon for Hassan, Ahmed and many other Syrian refugees, is becoming a new exile, stuck between a rock and a hard place. The West who has shown its ‘generosity’ in sending weapons and terrorists to Syria to satisfy their goals of destroying the country, are much less generous when it has to host refugees in their own country. The Syrians should be forever “grateful” to the West. This is nothing new, just look at the dire straits of Palestinian refugees who after 70 years have still a sort of status of non-persons (no permission to work, to own a house…). The authorities have always refered to the delicate sectarian balance in Lebanon. Truth is, you always find a pretext when it fits you.